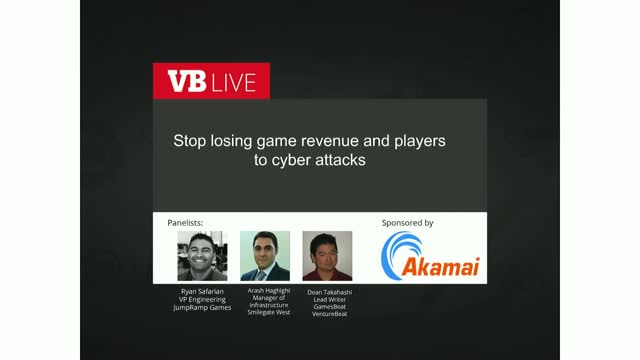 Cyberattacks cost companies over $1 million per day and the video game industry is being targeted more than ever. The global audience is huge and growing across demographics. The number of platforms, from personal computers, consoles and hand-helds to smartphones and tablets, makes a smorgasbord of vulnerable users. And then the bad guys get to work. Accounts are hacked to rip off virtual items your users have invested time and money on, and real-world identification and financial information is harvested for sale. All told, DoS attacks piss off users and drop game income, and more. Game publishers and developers are the ones who end up shouldering the blame, taking massive financial and reputational hits. But there are increasingly sophisticated ways to lock out the hackers, keep your users safe, and your intellectual property secure. Join this VB Live event to learn from digital security experts about the four key perimeters of defense, how to proactively secure your environment, and protect against the increasing number of hacks, DDoS attacks, and more. * How to prevent data breaches, SQL injections, cross-site scripting, remote file inclusion, and other cyberattacks.